For more than 300 years the Patriarch of Aquileia, who was a Prelate of the Roman Catholic Church, had ruled Friuli, the region north of Venice along the Adriatic coast, as a temporal fief. Abetted by the Counts of Gorizia, the Patriarch frequently sided with the King of Hungary, his eastern neighbor, in Hungary's recurring disputes with Venice. Finally, in 1418 a major dispute erupted between Venice and the King of Hungary over sovereignty of Dalmatia, the region lying opposite Venice on the eastern coast of the Adriatic. The Patriarch rashly decided to personally lead an invading Hungarian army attacking Venice from the north through Friuli. With the assistance of a dissident Friulano military commander, Venetian forces quickly seized the initiative, capturing Feltre and Belluno. By 1420 the Patriarch found his forces hemmed up and besieged at Udine. His calls to the Hungarian king for reinforcement were futile, because the King was by then embroiled in other serious military challenges in Bohemia in the west and with the Turks on his eastern flank. The fall of Udine left the Patriarch no alternative to accepting a humiliating peace. He ceded to Venice all of Friuli, except for Aquileia itself and two other towns. Gorizia also agreed to Venetian sovereignty. Venice had succeeded in doubling the size of her mainland territory in a single campaign. 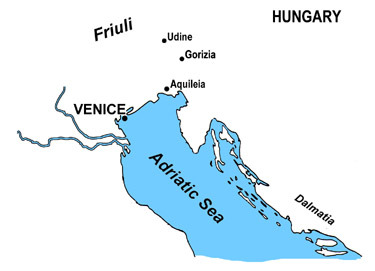 At the same time, a naval expedition reestablished Venetian control of the Dalmatian coast, resolving the issue that had precipitated the war in Friuli.